with many notable projects on the MFA in products of design program blog, designboom rounds up five of our favorites. 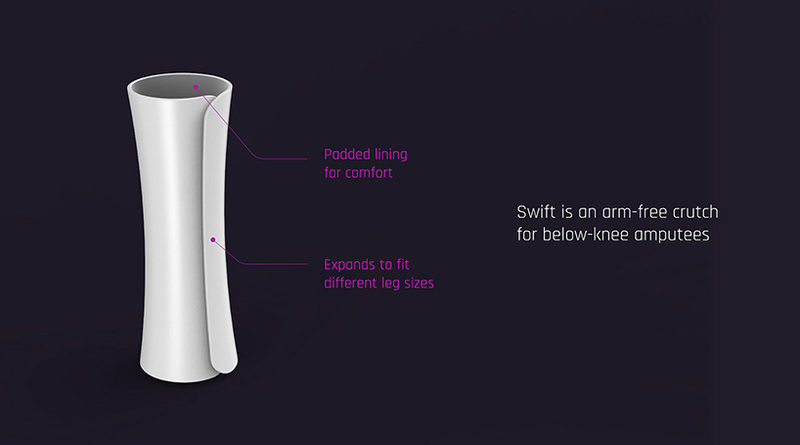 the ‘swift’ prosthetic is part of smruti adya’s thesis project, UPGRADE: designing for access and acceptability around limb loss and limb difference, where she designs products, services, and apps for amputees. 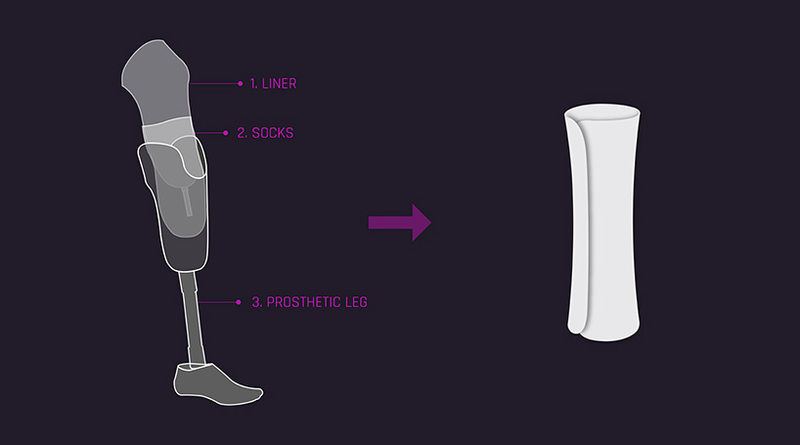 the prosthetic is an arm-free crutch for individuals with a below-knee amputation. 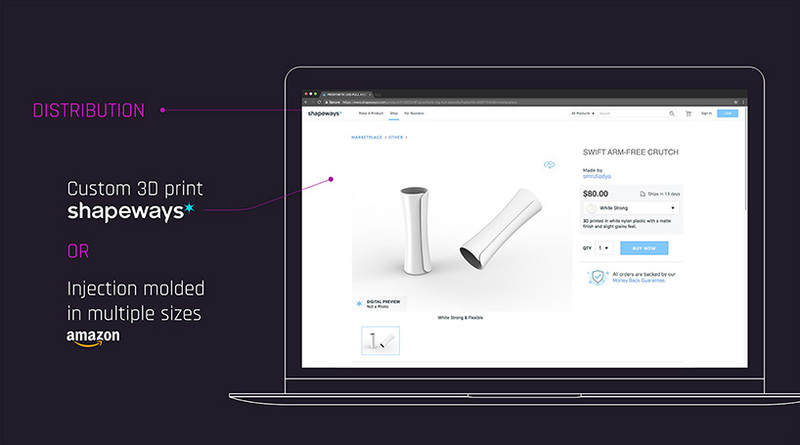 the designer adds that the product could be easily custom-made and delivered using 3D printing, or mass manufactured in multiple sizes and distributed through traditional and online retail. 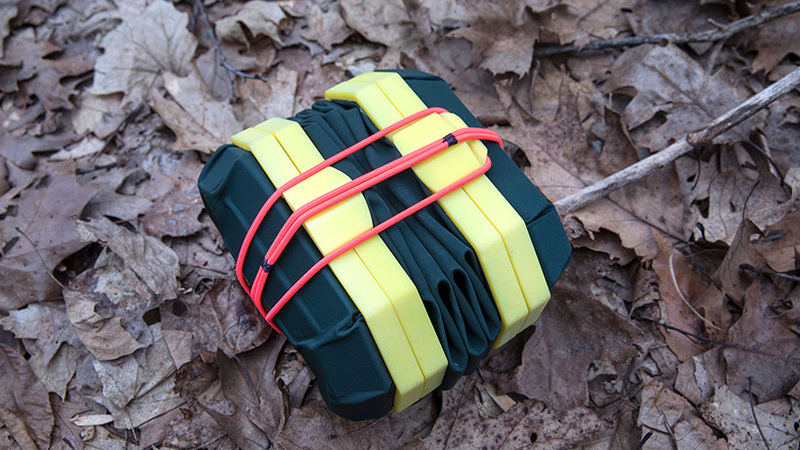 CARA – from the word ‘carapace’, the shell of a turtle – is a menstrual product and waste carrier designed for use in multi-day trips outdoors. 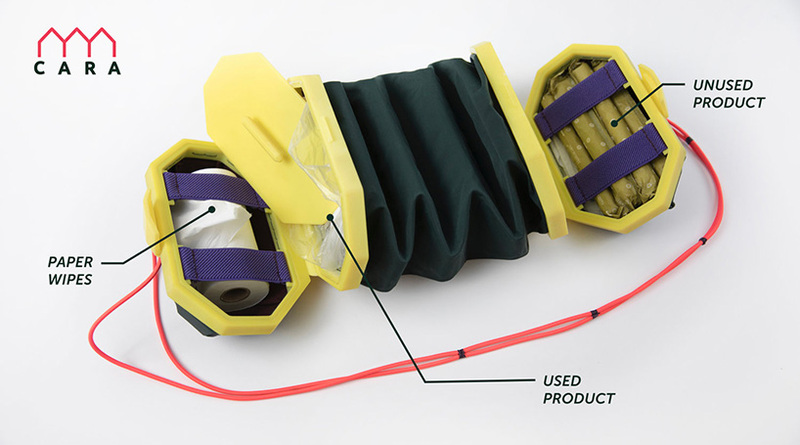 it features an expandable waste collection container at the center, and two separate dry enclosures at the top and bottom to keep unused menstrual products, toilet paper, and clean wipes. from the onset of alexia’s masters thesis, DARE + DEFY: a woman’s place in the great outdoors, it became clear that women are incredibly dissatisfied with the design of outdoor gear. the designer decided to challenge the ‘shrink it and pink it’ design attitude towards female products, and truly expand the typology of tools for women beyond the superficial to fulfil functional needs. after contacting women hiking communities online, alexia quickly discovered that there was nothing on the market designed specifically for this purpose. with women engaging in outdoor adventure in greater numbers, this became her design opportunity. 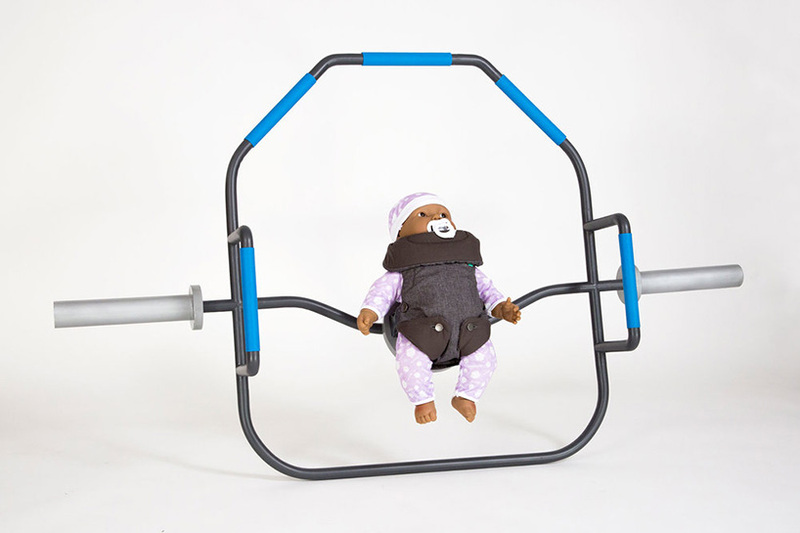 babygym is a piece of critical design that explores a hyper-masculine concept for fathers – a way to spend time with their newborns by using the baby as weight during lifting exercises. the hilarious but thought-provoking project was part of andrew schlesinger’s thesis work, GENTLEmen: challenging adults to raise feminine boys. in the form of an ‘infomercial’ spoof, ‘babygym aims to provoke a meaningful discussion on what it means to be a father today and ask why it is not normal for dads to engage in caring and nurturing activities with their child,‘ adds schlesinger. there are many products and services for mothers to bond with their infants – baby-yoga classes, jogging strollers – so the designer crossed the line of reasonableness. one of the products in manako tamura’s masters thesis, hacking the racial binary: design provocations for identity and shame, takes a look at code-switching. this is the practice of shifting the ways one speaks depending on context, such as when one changes their accent to sound more like those around them to fit in. with potential to partner with other companies, switch’s tracking system could share useful data and help expand hardware to challenge trends toward whitewashing in technological development. 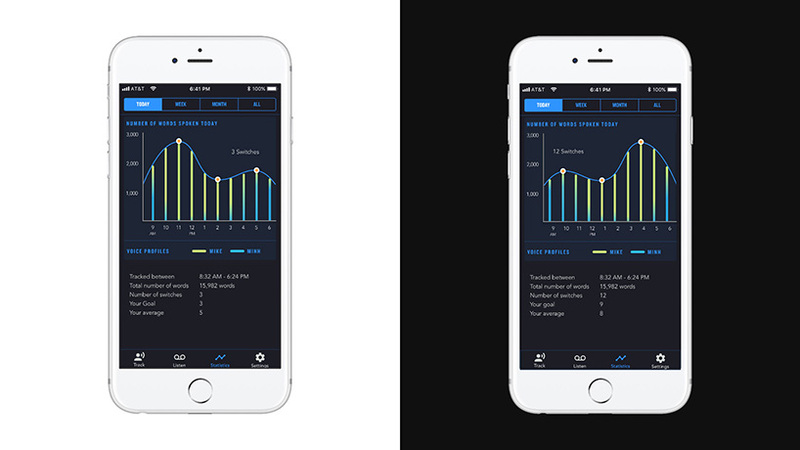 by implementing smart eyewear, for example, the app could track not only variations in speech patterns but also the visual elements of certain interactions that trigger code switches. furthermore, sharing data with developers of smart devices such as amazon echo or google home, switch could aid in the development of multicultural AI ‘voices’ that immigrant users would feel comfortable interacting with in their own homes. 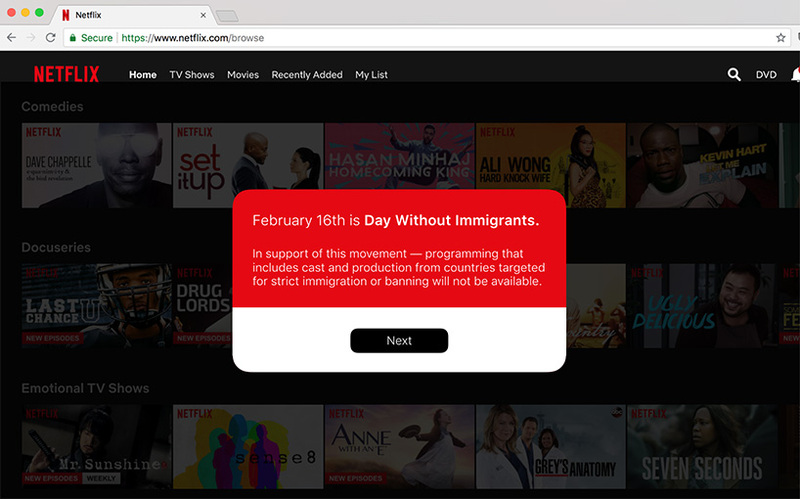 netflix reveal is a software extension that temporarily removes selected movies on your stream that are created by ‘immigrant’ or marginalized individuals. 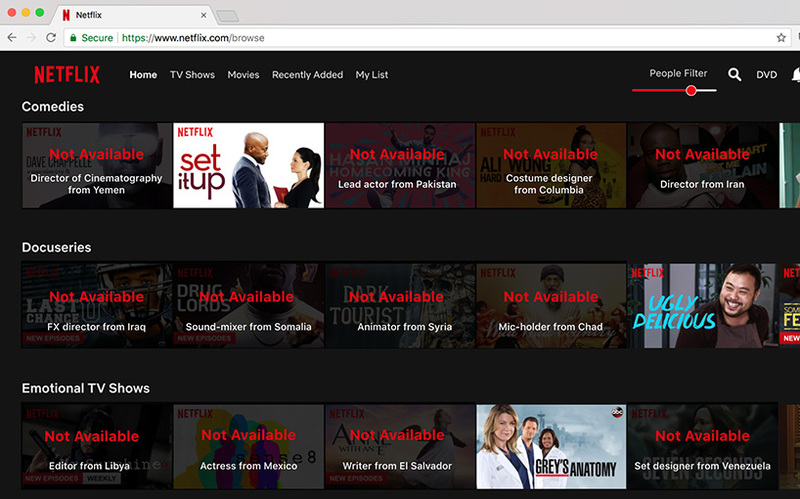 ‘netflix reveal makes the invisible visibly by illustrating what the world of entertainment would look like without the significant contributions of people from around the globe who make our movies and TV shows,’ argues schlesinger. for the shows that are still available, the designer added a map in the detail screen to show all the different countries where the director, editor, and actors are from. 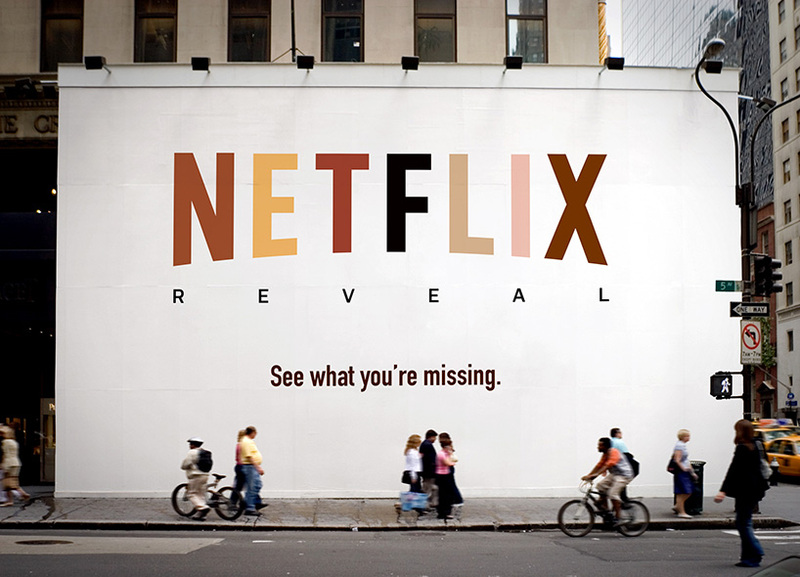 the netflix reveal project was part of a summer partnership with the omidyar network, where MFA products of design students created interventions around the topic of ‘independence’ using design to address one of society’s most pressing challenges: our increasingly polarized personal and political landscape. learn more about the MFA in products of design at their website, and check out 14 THINGS THAT MATTER: What distinguishes the MFA in Products of Design for a lightning-speed overview of the program.